UTEC has developed patented commercial explosive formulations and manufacturing methods and processes which efficiently and safely utilize and repurpose demilitarized energetic materials that would have been traditionally burned or placed in long term land-fills. This is a ‘win-win-win‘ situation for all concerned. It allows the military to remove outdated munitions, etc. 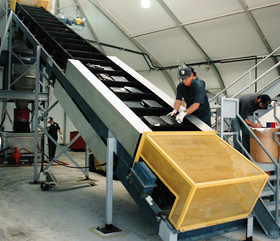 from their locations, it allows UTEC or its licensees to manufacture unique commercial explosive formulations, and it allows the end user, such as the mine, access to very energetic explosives at a reasonable cost structure. By utilizing this last bit of available potential energy from outdated materials this technology helps promote a ‘greener’ environment by reducing land fill issues and reducing the ‘open-burn’ method of destruction. Want to learn more about UTEC? Contact us now to learn more!